Recent post a great way to make your blog visitor and readers find topics that are published recently by you. In order to get your recent blog post with default Latest Post Widget, this can be put together to your latest entries sorted by category or label. 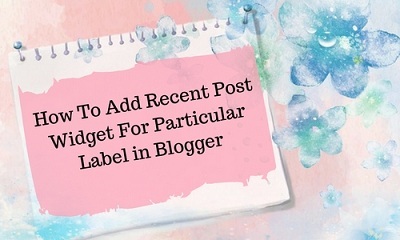 So, follow these simple steps and you will be able to show your latest post for each of your labels or category that you want to display with thumbnails for your blog readers. Step 1. Login to your Blogger blog and click on Theme or Template. Step 2. Select Edit HTML and by pressing Control + ‘F’ find ]]></b:skin&gt; code. Step 3. Paste the below CSS style code just above the ]]></b:skin&gt; code. Step 5. Now, paste the below code just above the </head&gt; tag. Note: In order to add your own image, replace the image URL that is highlighted by red color with your own image URL. Step 6. Click on Save to save the changes that you have made. So far, we have added the CSS style code and the script and now, we have to add the actual magic code to your blogger. Step 8. Now in the pop-up menu and paste the below code and Save. Change the highlighted with red Name of the label with your own label name. Within the last code, there are some codes which you can make your own customization like you can change from true to false or vice versa. Remember that your Widget will display your latest post only from a particular label that you have added. Var numposts - Add the number to posts you want to appear in your recent post widget. Var showpostthumbnails - You can show or hide the images of your post by simply typing true, to show and false, obviously not to show. Therefore, if you want to display your latest posts from other labels or categories, repeat step 8 to show recent posts from other categories as well.